Trichomonas vaginalis is a parasitic flagellated protozoan. Flagellated: these organisms have a flagella and are motile when viewed under the microscope. Lack of cysts: This organism can not exist outside the human host because it can not form cysts. Sexual contact: this parasite is sexually transmitted. Condoms may reduce the rate of transmission. Trichomoniasis: this manifests as a vaginitis in women, and a urethritis in men. Metronidazole is the antibiotic used to treat the affected patient (and also for partner prophylaxis). 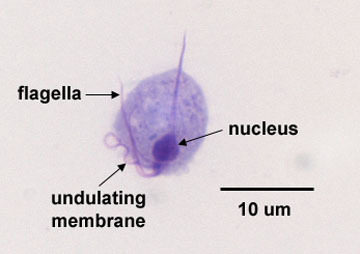 This is the only protozoan that never exists in cyst form. This is because it never leaves the host and is sexually transmitted.